BEND, OR -- Two men face burglary charges after they were found hiding in a shed by a Deschutes County Sheriff’s K-9. The burglary victim returned to Gentry Loop, northeast of Bend, and reported hearing people inside the home. Investigators say the suspects left prior to the deputies’ arrival, but witnesses saw two men in the area and a K-9 unit tracked them to a nearby shed. 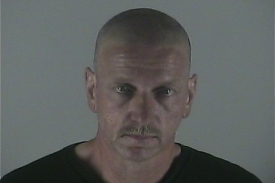 They say 49-year-old Daniel Webb (pictured) of Bend, and 27-year-old Charles Mansfield of La Pine initially refused to come out, but after pepper spray was deployed, the two men were taken into custody without incident. Webb is charged with Burglary I, Driving While Suspended, Meth Possession, and Parole Violations. He was arrested for suspected car theft in October 2015. Mansfield is charged with Burglary I.